The flu vaccination does not appear to have been effective in protecting against so-called Aussie flu, figures show. Data from Public Health England (PHE) on influenza vaccine effectiveness across the UK found that only a small proportion of older people were protected. One of the strains circulating in 2017/18 - H3N2 - was dubbed Aussie flu because prior to the flu season in the northern hemisphere it was circulating in the southern hemisphere, where Australia had a particularly bad flu season. The PHE figures show that vaccine effectiveness against A(H3N2) was 16.4% for all age groups. It was 16.8% among the over-65s. Every winter there are a few strains of flu circulating and the latest PHE data also assesses how effective the flu jab was across other strains of influenza - A(H1N1) and B. Overall, the flu jab was found to be protective. Effectiveness was 15% against all three strains of flu. It was highest among children. The vaccine was 26.9% effective in children aged two to 17 - who received the nasal spray - 12.2% in at-risk groups aged 18 to 64, and 10.1% in those aged 65 and over. The PHE report highlights how the composition of the flu jab is being updated next year. A new adjuvanted vaccine will be available for older adults with a quadrivalent flu jab for younger adults. PHE reports show how during the 2017-18 season, "moderate to high" levels of flu activity were observed in the UK. Figures show that between October 8 and April 15, there were 15,004 deaths linked to flu in England. Deaths were particularly high in the elderly, but were lower than the 2014/15 season when more than 27,000 deaths were recorded. 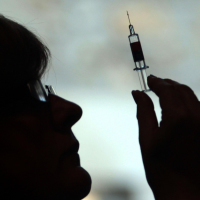 Dr Paul Cosford, PHE director for health protection and medical director, said: "Vaccine effectiveness varies year on year as the flu virus changes and is difficult to predict. "This upcoming season we are recommending that all those under 65 have the quadrivalent flu vaccine, which protects against both the main B strains and the two main flu A subtypes. "We are also making a new booster vaccine available for all adults aged 65 or over in order to improve the immune response. "Vaccines are the best defence we have against flu and not only protect people who have received the vaccine but also those around them. "We encourage everyone eligible to take up the offer of the vaccine this winter." Guard against all eventualities before jetting off on your next trip by protecting yourself with our travel insurance options.